Recently I started getting more into metal smithing, so I am always on the look out for free easy tutorials. I ran across this one awhile back and saved it. 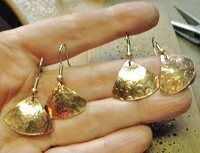 If your just beginning in metal smithing you might want to check this easy textured copper earrings tutorial out.